© Posted on November 13, 2017, by Michael E. Newton. Last week, I shared with you the oldest known Alexander Hamilton document, in which Hamilton and David Beekman, one of Hamilton’s employers, acted as witnesses to an appraisal and signed their names to the document on April 22, 1767. The original mortgage, which has not been located, was signed by “John Cebra, Attorney to Mr. Joseph Robinson.” It was also “Signd Seald and Deliverd in the Presence of” two men: “Nichls Cruger” and “Allexr Hamilton.” The text of the mortgage document along with the accompanying signatures were all copied into the official record of Christiansted, St. Croix, on August 17, 1767 (this date is mentioned on a previous page), and subsequently published on August 20, 1767. 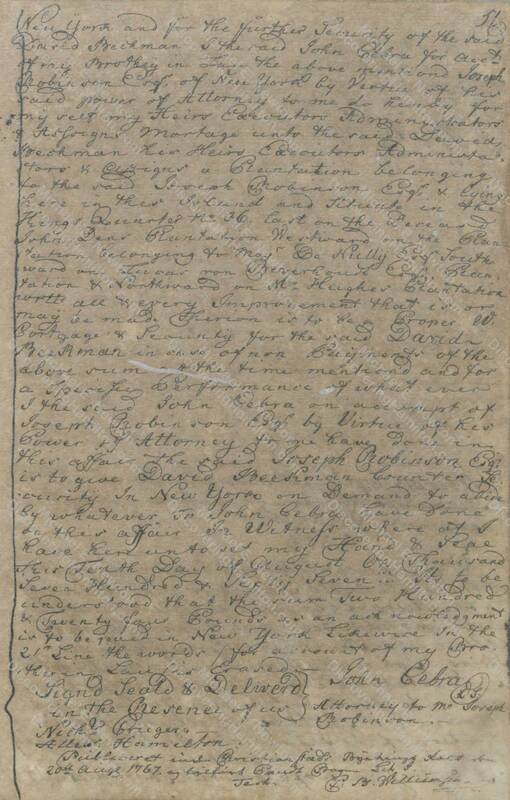 Here in this record, we see an Alexander Hamilton acting as a witness alongside Nicholas Cruger for a mortgage benefiting David Beekman, with the original mortgage document being “delivered” to Beekman “in the presence of” both Cruger and Hamilton, who then signed the document as witnesses. For those not aware, Nicholas Cruger and David Beekman were business partners and Alexander Hamilton was one of their employees. To see an Alexander Hamilton together with both Beekman and Cruger at this time is clear evidence that this is our Alexander Hamilton and not someone else with the same name. 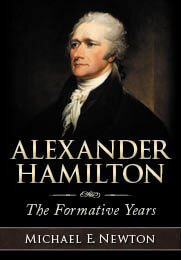 It also supports the conclusion, which was presented last week, that it was Alexander Hamilton who acted as a witness and signed the appraisal alongside David Beekman on April 22, 1767. 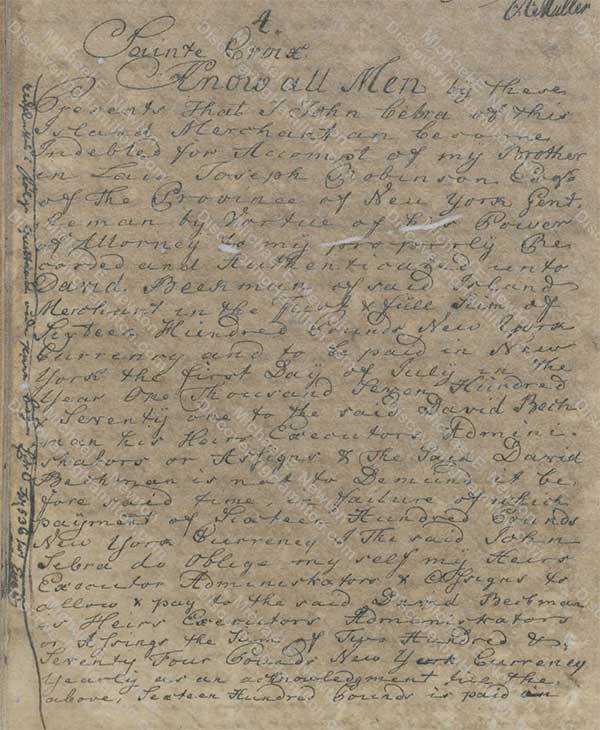 That makes this mortgage record of August 10, 1767, the second oldest known Alexander Hamilton document, behind only the appraisal record of April 22, 1767.